I had played the game as a female trainer, so never encountered or heard about such a character. Upon doing some research, she only appears for the male trainer. Many others (including Bulbapedia’s trivia section) made the same claim the reader was curious about, but there was never any exact dialogue presented. So! I decided to hunt down the scene in both languages and present them side by side here for our reference! UPDATE: I wrote another article on this which takes a look at the second dialogue in English. When you complete reading this one, head on over there to read that one! For reference, this is a Nursery Aide (ほいくし in Japanese). Her name is June in English, and Enatsu (エナツ) in Japanese. Now let’s look at the dialogue! (Apologies in advance for the dialogue spacing. There is only so much a free blog’s interface can do). Feel free to refer to this easier-to-read infographic on the matter. なんか　もう　このまま　こうしてたいな I wish I could just keep battling… Your Pokémon are sure strong. 仕事なんか　辞めちゃいたい･･････ It makes me want to just up and quit my job… I can tell you’ve raised them with care. トレーナーに　怒られちゃって･･････ looking after got mad at me… how a Pokémon is feeling! 遊んで　ケガするの　どう思う？ get injured when battling or even playing? But, that’s enough of that. わたしは　そういうことって　大事な I always thought that it’s There has to be some reason we met. 経験だと　思ってたんだけど a valuable experience for them, Let’s spend a little more time together! 最近は　もう　なんだか　よく but, recently, I’m not really C’mon! Come with me! ･･････って　まあ　グチは　あとあと！ … Anyway! I can ramble more later! 次は　観覧車に　いこっか！ Let’s get on that Ferris wheel! うーん　やっぱり　夏に Phew… I guess I should’ve expected Hee hee… That was so fun! なんか　顔が　バオップだけど？ Your face is as red as a Pansear! Pokémon in place of busy Trainers. 無理やり　頼みこんだんだよね choice but to go through with this… Pokémon Trainers are pretty great. そしたらさ　女性として I was told if I wanted this job It makes me happy. 働くなら　採用っていわれてさ I’d have to be a woman… Thank you! See you again! ふふふ　TRAINERくんの　おかげで Hehehe, thanks for hearing me out! なんか　やる気でたよ！　ありがとね！ I feel more motivated now thanks to you! Well now, that’s quite the change! And answers “yes, it’s true!” to the reader’s question. Let’s take a deeper look at nuances and what changed, though! (For simplicity and to avoid confusion, however, I will continue to use she to refer to June/Enatsu). For the first half (before the Ferris wheel ride), both translations talk about her job. But in Japanese she is notably more exhausted by the job itself, opposed to the localization where she mentions “being tired” but not in the sense of “wanting to quit” (as implied later). She also mentions feelings regarding Pokémon and battles, which is nonexistent in the English dialogue (see notes on this point, as it may have to do with a limitation when writing these transcripts). On the Ferris wheel itself, both versions just talk about how they get drenched in sweat, to the point the clothes stick to them. I cut out the dialogue as it was not relevant to the rest, though it is important only in the contextual sense that it is really hot. Then it’s after the Ferris wheel ride where the dialogue really changes up. In the official localization, she brings up some points she made in Japanese before the ride itself (about trainers getting mad at her, vaguely discussing what she does as a job). She is a “Nursery Aide” in English, though her Japanese title already implies what she does (“Kindergarten Teacher/Nursery Aide”). So it is likely why she does not expand on it. However, in Japanese the trigger to discuss her gender comes up when she suggests the male trainer remove his shirt –and not to be embarrassed because he’s with another “man” (as opposed to feeling shy around another girl). Upon mentioning this, she comes to realize she wanted this job so badly (and/or wanted to keep the job if she already had it, as it is vague as to what position she had first) that she went through with this (against her will, no less). This in turn makes her feel she shouldn’t give up as she had went this far, thus reinvigorating her motivation for the job, and thanks you for it. One major note not addressed in trivia or discussions that I saw: it is vague as to whether this was voluntary or involuntary. The Japanese dialogue makes it sound like she could have already had the job and changed (be it via cross dressing or not) to be a woman to keep it (at the urging of the employer) –or that she wanted it badly enough to change to get it (and the “no choice” thus refers to desperate and saw no other way). Though regretful at first (due to perhaps not wanting to change, still acknowledging herself as a man), she realizes if she went through all that –she must truly have wanted it! In English it is about her opinion on Pokémon trainers, rather than what she does for work. It is a clever tie-in to her line about trainers getting mad at her, which is what the localization chose to expand upon while leaving the surprise gender reveal aside. UPDATE: My friend and twitter user @Nirbion reached out and confirmed with some colleagues that the German version/translation stays true to the dialogue in the Japanese version of the game. It is interesting how the different localizations take different approaches to the matter. We are not sure if this is the case with the rest of the EU English translation, however. Below are some final notes I included about the dialogue, and afterward I provide videos that show both scenes (in Japanese and English). They are camera based videos, and I could not find any others for the scene! The dialogue is from after the trainer battles them. In both versions both pre-battle dialogues are irrelevant to the question above. June/Enatsu uses the gender neutral pronoun “watashi” to refer to herself. While I state “literal” translation, I took liberties in making it flow better in English while staying close to the original meaning. A true literal translation for informative purposes would come off more awkward, but I feel little nuance is lost in this version so did so. (For those who speak Japanese, that is why the words may not be 1:1 with each other). When writing the transcript for the video in Japanese, it seemed almost like it was a second encounter (due to her stating the trainer’s name). The English meanwhile seems to be from the first encounter. If anyone has the Japanese dialogue from first encounter, and whether or not it changes significantly, please let me know. This is the one major limitation of digging into something so obscure! (If anyone likewise has a text dump in Japanese that would also be helpful!) As far as I know, however, even second encounter in English does not make the same revelation as the above. I went off the assumption that dialogue changes between encounters is minor. UPDATE: Twitter user @technickal101 sent me the second dialogue in English. It is must closer to the Japanese, but still differs in some places significantly and does not address the reader’s question. Check out that article here. English: (Note how the description also mentions “hearing” about this, but not confirming it). Is Nursery Aide June really a man in Japanese? The answer is: Yes! But what trivia and other discussions I’ve seen around it ignore the motivation beyond “wanting her job” and such, where there is a deeper story implied to be behind the scenes in Japanese where in English it is just about her opinion on trainers. The main limitation that I wonder about (but have been unable to verify) is whether there are changes between first and second encounters. Please let me know if there are! UPDATE: It seems the second-time dialogue is different in English too! It stays closer to the meaning, but still differs in some places. See the comparison here. I hope this serves as a helpful reference for those who see this bit of trivia in the future. I hope it can be a webpage they can point their friends toward who may need evidence or dialogue for reference. It’s always fun seeing small things like this change between games. Ideally, I want to check out the Pokéstar Studios / Pokéwood movies and see what may have changed between them. If there is anything else you wish to compare in the Pokémon series (or any other series, such as Fire Emblem), I’m more than happy to look into it! 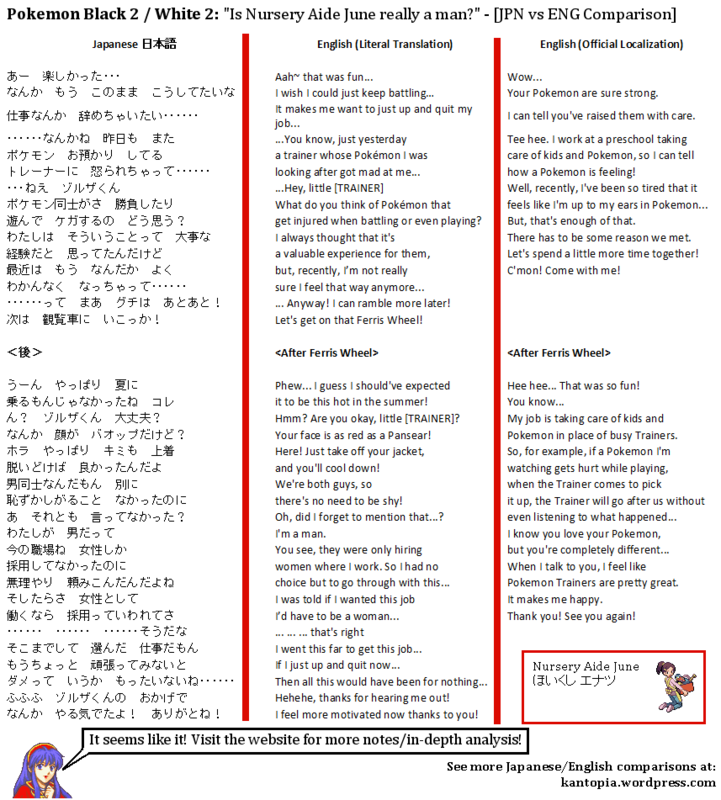 This entry was posted in Comparison, Pokemon, Translation, Video Games and tagged black 2, enatsu, english, gamefreak, japanese, localization, localization change, nintendo, nintendo ds, nursery aide june, pokemon black 2 white 2, pokemon company, rondez-view, Trivia, white 2. Bookmark the permalink. Honestly, you’re one of the best bloggers on wordpress. You go into such detail and take us step by step to show us the exhausting but rewarding process of translation. I sincerely appreciate it and respect you for that. I find it so funny how different cultures view topics like this one. It’s quite interesting to see how the translations were handled. Haha not at all! And it’s not trivial at all! I’m sure so many other people besides those who send you inquiries are really curious about so many little things that you are curious about as well. It’s a trap! No surprise that the English version would side step the gender thing given how the localizers censor controversial content in other games. Indeed! Germans went through with it, but English takes steps to be careful.